Missing the fajr prayer leaves you with a bad feeling the whole day long, it’s like you missed something, and indeed you did miss something… you missed the reward for the two rak’ats sunnah are more worth than the whole world, leave alone the obligatory part. 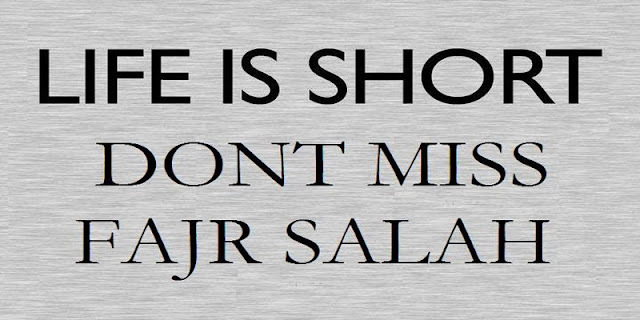 NOW LET’S COME TO THE PART, HOW YOU CAN WAKE UP FOR FAJR EVERY MORNING. 2) Place your alarm across the room or even in another room, but still loudly hearable (This is how I do it, at least 10 steps to walk until I reach my phone to turn off the alarm) This makes it much easier to stay awake. 3) Make sure not to snooze. They say “you snooze, you lose”. Snoozing is a contradictional action. If you don’t like waking up, snoozing is like doing the waking up procedure again and again… Snoozing may cause you to go to deep sleep again, and you’re not supposed to wake up from deep sleep. 4) Stay strong fighting against Satan who keeps telling you to go to bed which is still warm and comfortable, show Satan that you are a winner and you’re not giving up. 5) Make a proper but quick wudu and hasten to start the prayer, since making it a long procedure may cause you to neglect it soon again. 6) Make a checklist and track your process for the daily prayers. This may motivate you to keep going. 7) You probably heard about the sleep cycles. So every human completes an entire sleep cycle in 1.5h. That means at the end of the multiple of a sleep cycle (i.e. 1.5h, 3h, 4.5h etc.) you can wake up fresh and rejuvenated and not lazy. Calculate your sleep cycles and set your alarm according to it. In other words, if you sleep at about 11pm and fajr is at 5.30am make sure to set your alarm at 5am, then you have a nice 6h of sleep. If you think you need 30 minutes to fall asleep calculate it and add that time accordingly.